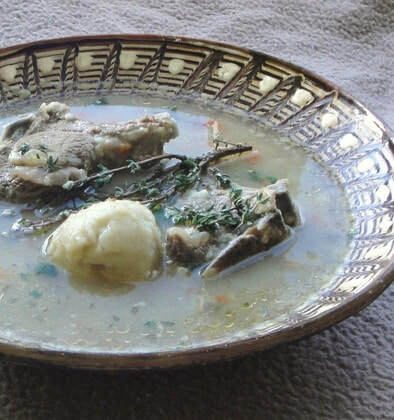 Pepperpot Soup is not a dish that I grew up consuming on a regular basis. 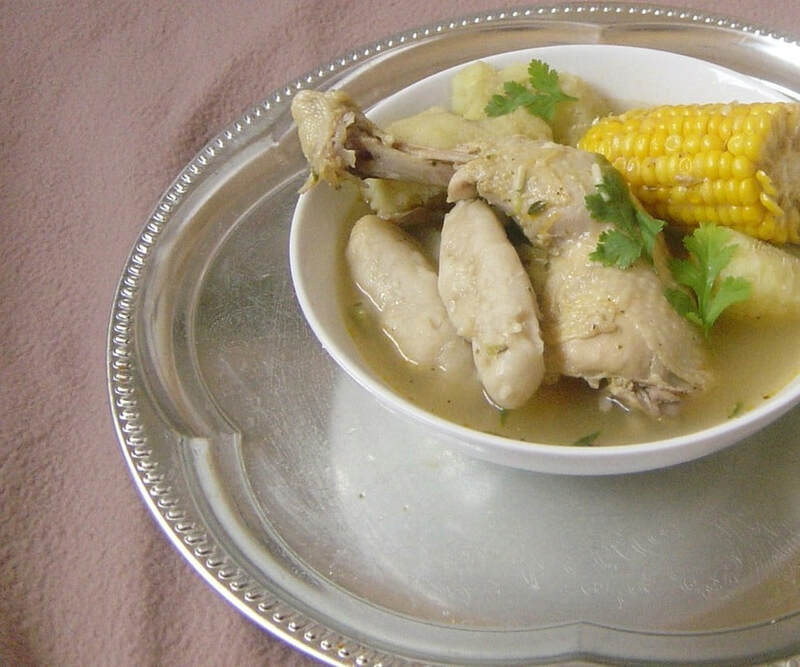 My mother made chicken soup, that was her thing. 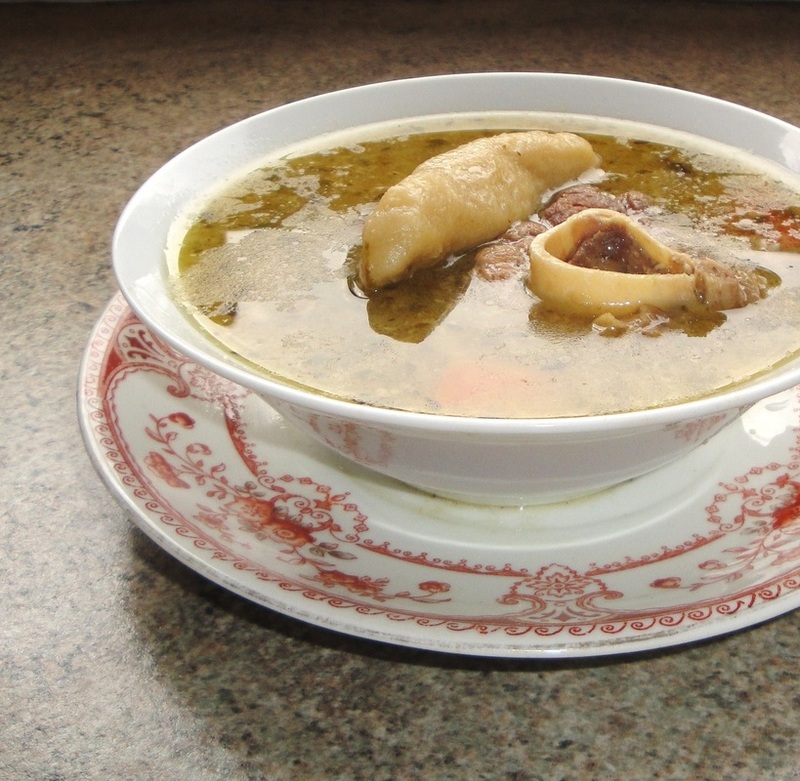 However when I would visit the Jamaican countryside where my grandmother lived, chances are she would be cooking this soup or stews that are similar. 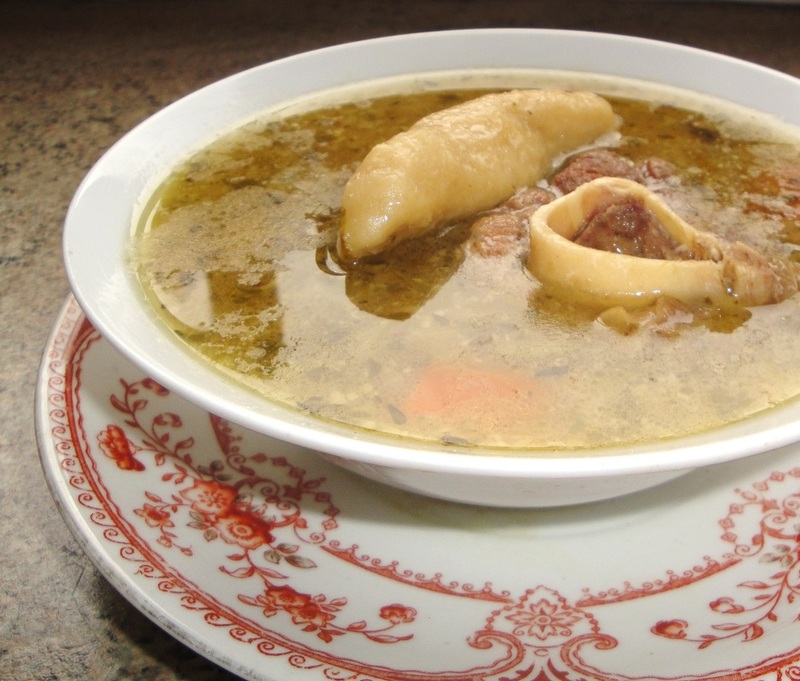 Pepperpot Soup done the Jamaican way, is nothing like Guyanese Pepperpot, and Jamaican Spinner dumplings are a must for this dish. 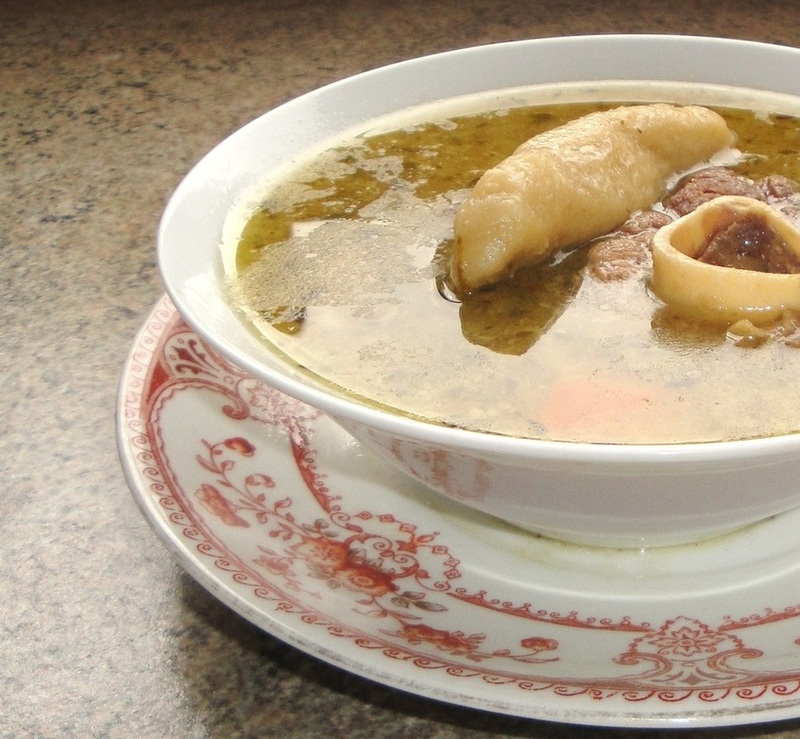 This soup is usually made with beef, and often pork-pigtails. I used goat with the pork instead. This dish is nutritious, seriously tasty, and a Jamaican treasure. In a separate pan: ADD the pork, and then add water. Make sure the water covers the meat. You also need to add 1 yellow onion peeled and a bulb of garlic halved, and half a teaspoon of salt. Stir the ingredients. The Reason this is done in a separate pot is because the pork usually cooks quicker than goat. Bring to a boil for ten minutes, then cover and simmer the pork on low for approximately 1 hour. You will add the stock from the pork to the soup when the pork has simmered for at least an hour. 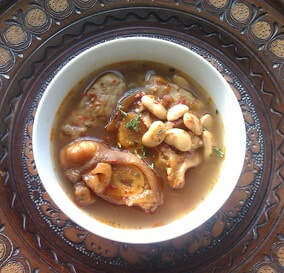 If the pork is not cooked or not quite, you can finish cooking the pork in the soup. Just estimate the time you think the pork will need to cook; for example if it needs half an hour, just add it to the soup thirty minutes before it finishes cooking. 1. Sprinkle 2 teaspoons of soy sauce on the goat and a teaspoon of salt. Rub these ingredients into the meat. Add the oil to a large pot on medium high, and add the goat, sear the goat to seal in the juices and also to brown for about ten minutes. 2. Add about 6 cups of water to the pot. Remember you will add water from the pork stock later, so you don't have to fill the pot. Add a teaspoon of salt, a teaspoon of soy sauce, cilantro, thyme, a bell pepper; chopped and seeds kept. And All Spice. As well as Onion, Scallion, and Garlic peeled, chopped and diced. 3a. Bring to a boil for ten minutes and then cover and let simmer for an hour. 3b. After an hour the pork should have been cooked. Strain the broth into the soup pot with the goat and set aside the pork to add the the soup when it's finished cooking. Note: You don't have to strain all of the pork broth into the soup. Use your judgement, if there is too much broth, and spilling over the pot, just fill it up respectively. You can always save the pork broth for another time, or discard. 4. Let the soup simmer for another hour. Test for salt and pepper, and add accordingly. Afterwards add the chopped okra. 5a. Last but not least make the spinner dumplings. Add 1 plus half cups (1 +1/2) to a measuring jug. Pour the flour into a large round plastic bowl and sprinkle half (1/2) a teaspoon of salt to the flour and mix. 5b. Then add warm water to the dough, little by little until you have a nice soft dough. If the dough is too sticky add a little more flour. If it doesn't come together, (brittle and dry) add a little more water. The dough should have the consistency of pizza dough. 6. Knead the dough and leave it to sit for about ten minutes. Then pinch the dough and spin and form the dough into thin cylinder shapes. Repeat this by pinching small pieces of the dough, one at a time. 7. When finished add the dumplings to the pot all at once so they cook evenly. Bring the pot to a medium boil and cook for about fifteen minutes. The soup should be ready after this. Once taken off the stove, add the potatoes/yams, edoes and pork. Serve as you wish. This soup should store in the fridge for up to five days, in air tight plastic containers.